Our hood cleaning company provides reliable commercial kitchen hood cleaning services on affordable prices. So many hood cleaning companies out there claim that they provide excellent cleaning services. Which one you will pick, the one offers lowest price or the one provides quality and reliable hood cleaning services. You should also know if they are able to clean entire kitchen exhaust hood system from top to bottom. 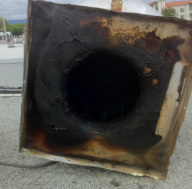 When there is good amount of grease on your kitchen exhaust hood fan it may cause your hood fan go out of balance. Exhaust fan is the first thing we clean. 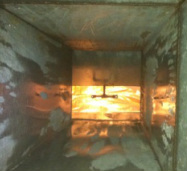 We are scrape all the grease from exhaust fan housing & Fan blades. After grease removal we use chemicals and steam clean the fan. 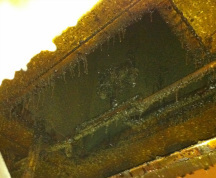 If the kitchen exhaust duct is not being cleaned, the grease Accumulation in exhaust duct work will have many negative effects. 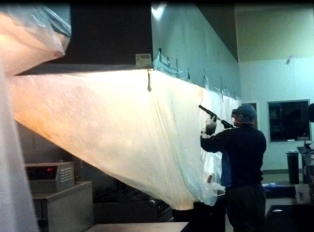 We scrape the grease from exhaust duct and spray chemicals and steam clean the hood duct work to bare metal. High risk of fire occurrence. Unsatisfactory exhaust air flow performance. Kitchen room temperature unusual hot. This is the area behind the kitchen hood filters. We scrape the grease and apply chemical and steam clean it. Some times we have to apply many chemical applications in case of heavy grease build up. we cover the entire hood with plastic sheets to collect the grease and dirty water. Kitchen hood plenum is very important to be keep cleaned at all times. Many restaurant and commercial kitchens clean there hood filters and plenum area weekly or more often depending on how much cooking is being done. Due to heavy cooking in commercial and restaurant kitchen appliances get greasy very fast. We provide complete kitchen appliances cleaning services. Our company cleans the grease and steam clean appliances. We also provide grease cleaning services for the floor, under and behind the appliances. We can also clean grease buildup on gas piping behind the appliances. 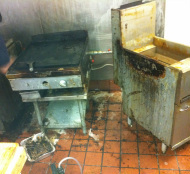 As you might know many fires take place in restaurant kitchens due to grease buildup on appliances. Contact our office today and get quote for your appliances cleaning. We also provide pressure washing services as well. Hood Cleaning San Jose, Santa Clara, San Francisco, Cupertino, Campbell, Sunnyvale, Saratoga, Palo Alto, Redwood City, Menlo Park, San Carlos, Belmont, Brisbane,burlingame, Milpitas, Mountain View, Los Gatos, Los Altos, Gilroy, Fremont, Newark, Hayward, San Leandro, San Lorenzo, Castro Valley, Oakland, Alameda, Berkeley, Richmond, El Sobrante, Vallejo, Martinez, Concord, Pleasant Hill, Pleasanton, Walnut Creek, San Ramon, Dublin, Danville, San Pablo, Albany, El Cerrito, Piedmont, South San Francisco, Half Moon Bay, Colma, Daly City, Mill Valley, Napa county, South San Francisco, San Rafael, mill valley, novato, San Mateo, San Bruno, Santa Cruz, Watsonville, Salinas, Tri County, Bay Area, Northern California, Service Areas.